Learning how to measure is an important science skill. Measuring is used in science data collection. Measuring is also a necessary life skill. Think about how often you measure something. You employ measuring cups in the kitchen for recipes. You use tape measures and rulers to build something or when decorating a room. Measuring may seem like an intuitive skill, but it really does need to be taught. And just like any skill, measuring requires practice. 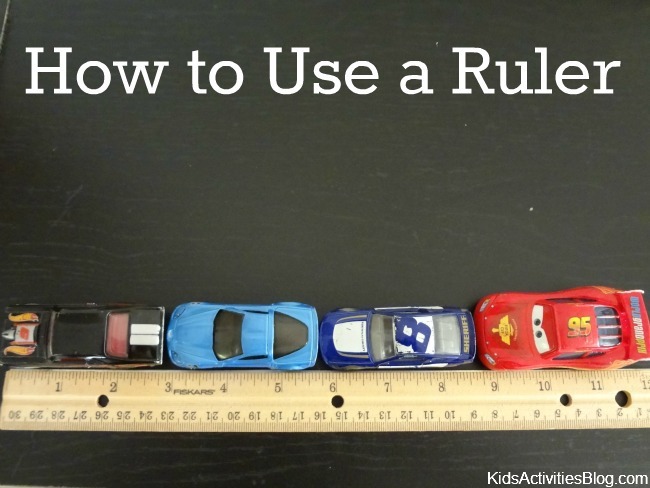 Here are some ideas for introducing the skill of measuring to your child. 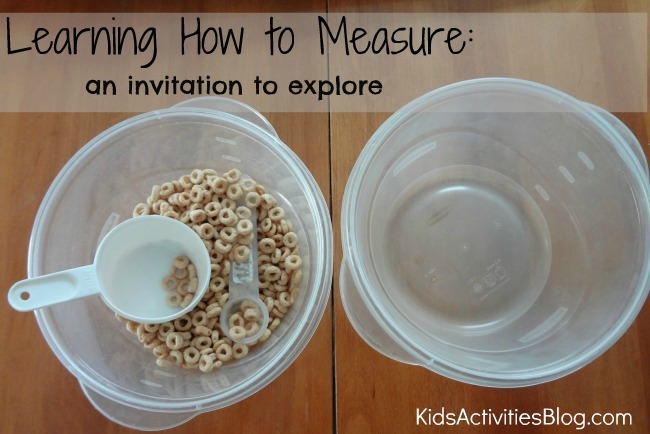 Set out bowls, measuring cups, and spoons for your child to explore. Practice measuring with a variety of substances. 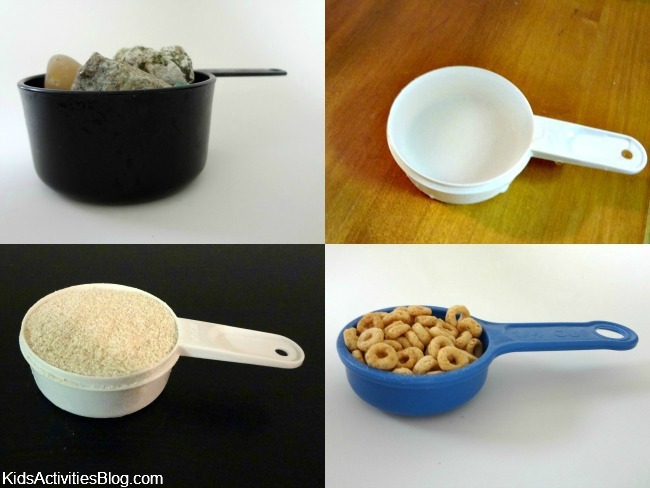 Cheerios, rocks, dominoes, flour, water, dirt, sand – whatever you feel comfortable allowing your child to use. Substances that can be level (like water, flour, sand, and dirt) are great for teaching the skill of line reading and making measuring cups level to accurately measure something. Letting your child help in the kitchen is the perfect time to hone measuring skills. Measuring ingredients for recipes and adding them in will give your child real life experiences to draw on later. Teach your child how to correctly use a ruler. Place the end of the object to be measured at the zero line on the ruler. For many rulers, the zero line is the end of the ruler; for other rulers, the zero line is the first mark on the ruler. For Aiden’s age, we just work on pointing to the number the object is the closest. For older children, you can show them how to use the marks in between the large numbers (1/2, 1/4, 3/4 and even the 1/8ths or 1/16ths if you are so inclined). It is also a great idea to teach children how to measure in both inches and centimeters. Each of the marks on the centimeter side of a ruler is 1 millimeter (1/10 of a centimeter). This division is actually a little easier than the sixteenths on the inches side of the ruler. Non-standard measuring is another way to teach children how to measure. Instead of measuring with a ruler with numbers, you use any object you wish to measure. 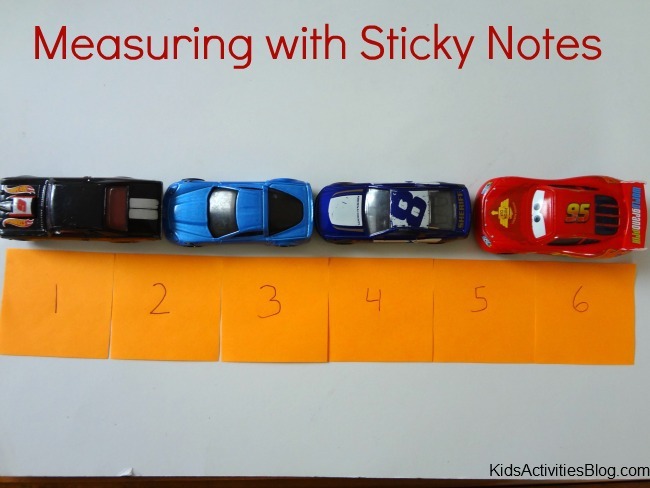 For example, we used sticky notes to measure Aiden’s cars. We lined up the sticky notes one after the other. Aiden’s cars were 6 sticky notes long. You can use your child’s hands, feet, or body to measure things. How many “feet” long is your bed? How many Aidens long is your room? Non-standard measuring introduces the concept of measurement and allows children to begin to practice the skill. Want more activities? Check out these 20 ideas to practice measuring gathered from around the web. However you choose to practice measuring, remember to have fun – the learning and skill building will happen as you play.